BLI-1043-1.5 :3.7v 1500mAh Li-Ion battery for SAMSUNG WiFi hotspot. Replaces part # EB504465VUBSTD. 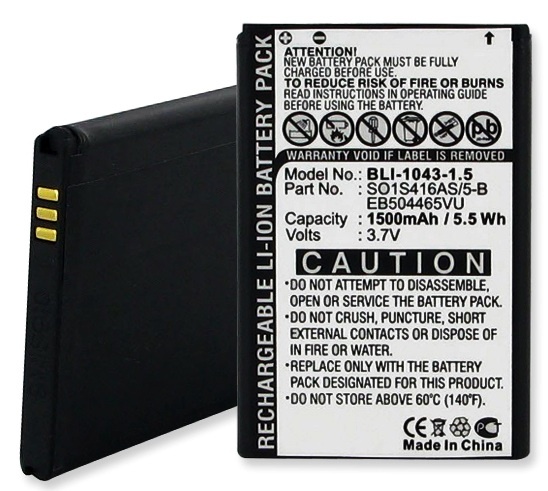 Battery size: 2.55"L x 1.73"W x 0.21"H. Also fits SAMSUNG cellular phones such as SAMSUNG ACCLAIM, ADMIRE, CRAFT, GALAXY PREVAIL, GALAXY S LIGHT RAY 4G, GEM, INDULGE, INTERCEPT, M828C, PRECEDENT, REPLENISH, REPP, ROOKIE, TRANSFORM, VITALITY, R720, SCH-I100, SCH-M828, SCH-R680, SCH-R880, SCH-R900, SCH-R910, SCH-R915, SCH-R940, SGH-T8039, SIDEKICK 4G, SPH-M580, SPH-M820, SPH-M910, SPH-M920.